Atlanta Baby Photographer | Audrey is ONE! I first worked with Jessica and Taylor for their maternity session in the park and Audrey’s newborn session after she was born! You can view their maternity session by clicking here, and Audrey’s newborn session by clicking here. Audrey also visited the studio for our 2017 Santa event and it was so much fun to see her and how big she had gotten! Jessica contacted the studio and asked to schedule a First Birthday session for Audrey. 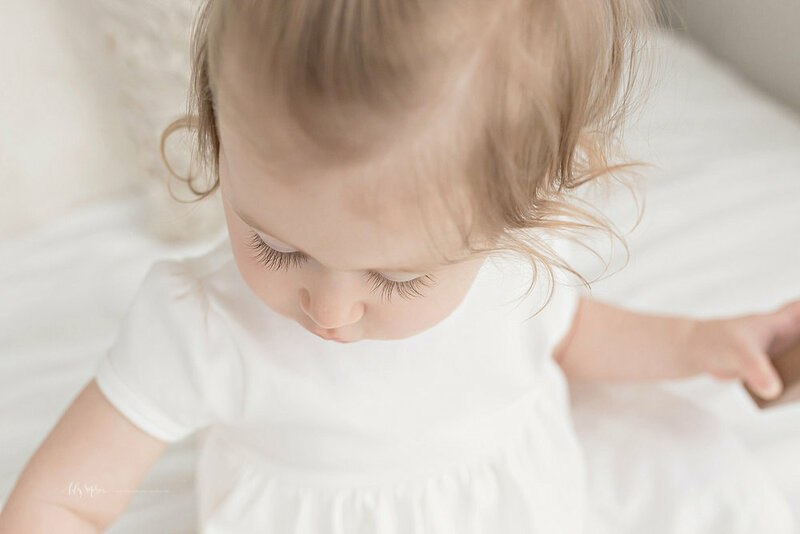 First Birthday sessions are such a fun way to mark your child’s first year and celebrate. A lot of people wonder if they have to include a cake: the answer is nope! Whether you choose to have a cake at the end of the session for your child is entirely your preference. We see a pretty even split with our clients, so there’s definitely no right or wrong choice. We sent Jessica the link to our Pinterest inspiration board and our style guide to help with planning their outfits for the session. We are always available to look through what you’re considering dressing your family in! You can either send photos via email for our input, or we can schedule a time for you to come into the studio for a quick consultation. Our studio wardrobe is also available to you to borrow from should you be interested in that! Most First Birthday sessions are scheduled around the noon-1 PM block. We want to schedule them at a time where you child is well rested and well fed. Scheduling right before naptime is setting your baby up for a naptime. 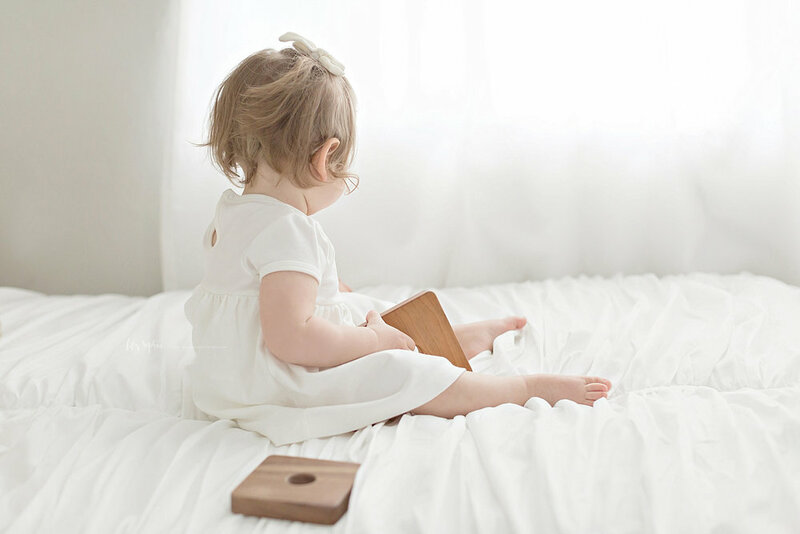 We will ask about your child’s routine when we schedule your session so it’s the most optimal time for your baby! When the family arrived at the studio, Audrey was a little bit unsure of her surroundings and of me. Her parents also informed me that she is definitely a more serious personality as well. I respect the space of my little clients and will never get up in their faces when we first get started. I always begin sessions with your little one in your arms. This helps them feel safe and secure. As our session continues, trust will build, and they’ll get used to me and the sound of the camera shutter. My personality and volume will mirror your child’s. As you’ll see from the gallery, Audrey was pretty serious when we first started, but I absolutely adore the resulting images. She warmed up quickly and we were having fun playing games together by the end of her session. Her mom brought the sweetest simple white dress and bow for her that was so perfect for her! A lot of my clients ask whether their baby should wear shoes for their session. My answer is: leave the shoes off for at least half of the session, if not all of it. This is really the last of your child’s babyhood… and I’m a big fan of those chubby baby toes and feet. For outdoor sessions, shoes may be necessary if your child is walking or if it’s cold outside. As you’ll see, Audrey’s mom opted to leave her barefoot for the entirety of our time together. If your baby is walking, I will also photograph images of them doing that. If they aren’t walking on their own, I’ll photograph them walking with your assistance. Some babies just refuse to do that, so we capture them crawling. 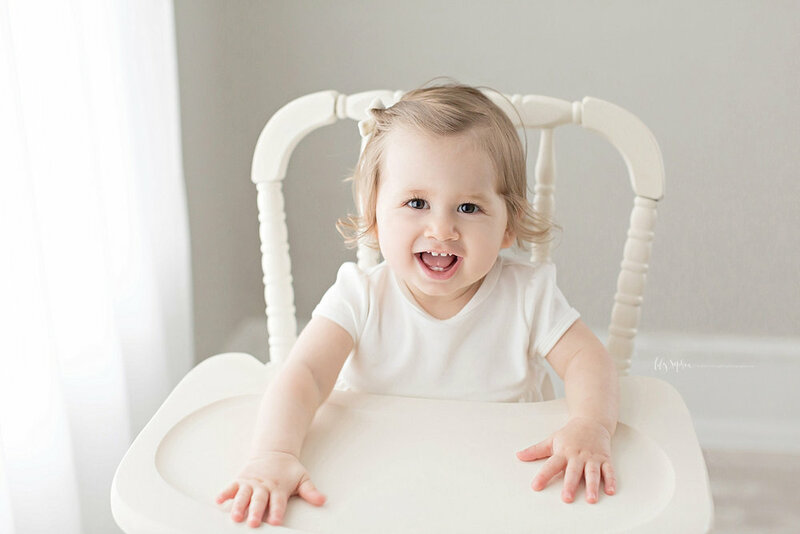 There is such a huge variety of images in a First Birthday gallery between solo baby portraits, the entire family, and individual parent images! 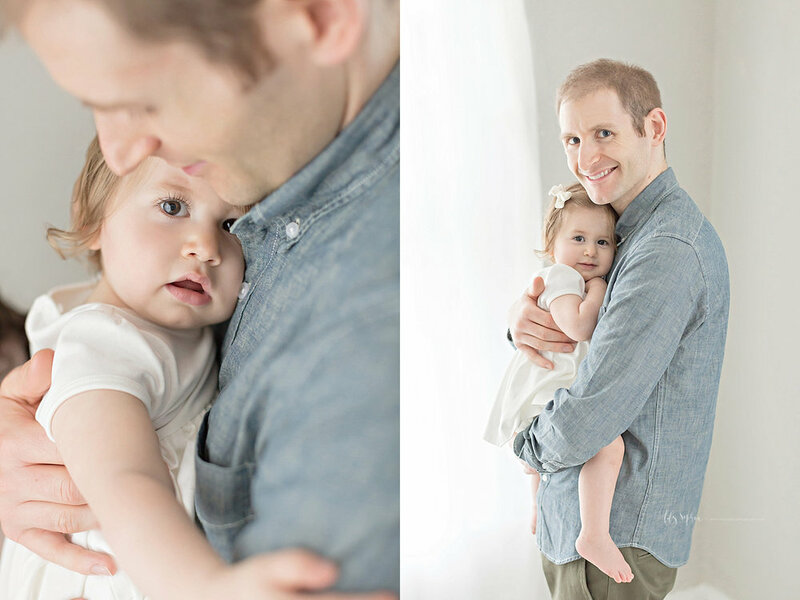 Here are a few of my favorites from Audrey’s First Birthday session! Atlanta Baby Photographer | Folarin is ONE! Atlanta Baby Photographer | Madeleine is ONE! Atlanta Baby & Family Photographer | In Home First Birthday for Ryan! 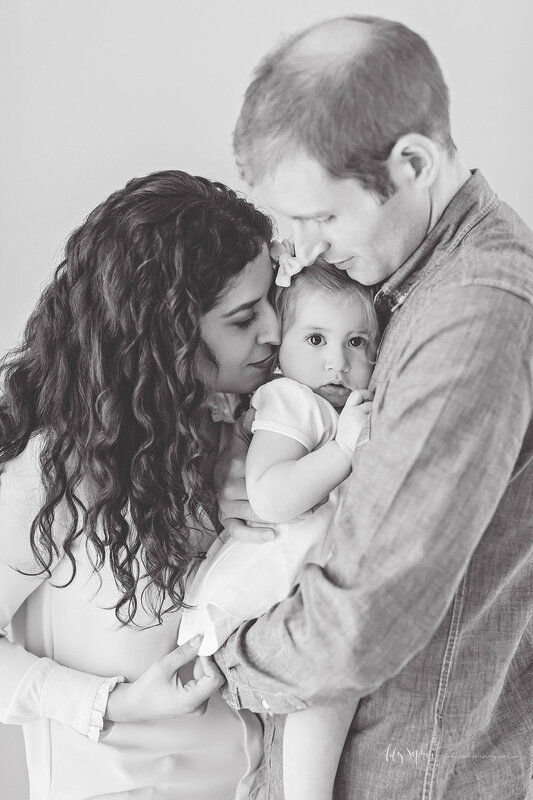 Atlanta Baby Photographer | Emilia is ONE! Atlanta Baby Photographer | Benjamin is ONE! Atlanta Baby Photographer | Samuel is ONE! Atlanta Baby Photographer | Ramsey is ONE! Atlanta Baby Photographer | Rowan is ONE! Atlanta Baby Photographer | Ella is ONE! Atlanta Baby Photographer | Leo is ONE! Atlanta Baby Photographer | Thomas is ONE! Atlanta Baby Photographer | Camille is ONE! Atlanta Baby Photography | Frances is ONE! Atlanta Baby Photographer | Robert is ONE! Atlanta Baby Photographer | Haylen is ONE! Atlanta Baby Photographer | Frances is ONE! Atlanta Baby Photographer | Logan is ONE! Atlanta Baby Photographer | Adeline is ONE! Atlanta Baby Photography | Emma is ONE! Atlanta Baby Photographer | DJ is ONE!